FEISTY flamenco in the street, lunch in a secluded walled garden, crashing a back-street bistro birthday party and, most embarrassingly, getting trapped in a multi-storey car park at 2am after repeatedly jamming my business card (rather than my ticket) in the machine! 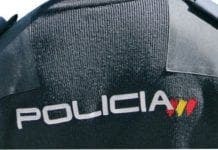 These are some of my overriding memories of Mijas. 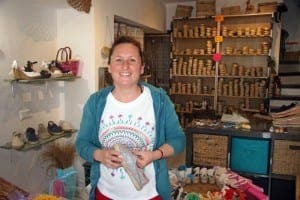 But there’s no time to dwell with the spring weather upon us and an Andalucian treasure trove to rediscover. The classic Spanish hilltop town of Mijas, known from Chelsea to China for its chocolate box charm, nails the quaint-small-town vibe at just a stone’s throw from the coast. Discovered by the globe’s more bohemian artists and writers in the 1950s and 60s, it was immortalised in Ronald Fraser’s 1973 book, The Pueblo, and continues to cast a spell on visitors today. Mijas is coming on in leaps and bounds – and it’s not just about the famous donkey taxis, colourful tourist tuk-tuks and zippy Segway-mounted police. The latest news is the enormous, €4.7 million renovation in the town centre which is seeing the main square transformed beyond recognition, with 70% coming direct from the European kitty. While change unfolds before your eyes in Plaza Virgen de la Pena, it’s business as usual for most, and tourists are still guaranteed a fabulous visit. The ways to get around are myriad, from the two dozen burro-taxis (€10 on a saddle, €15 in a carriage) to the white stallions bearing Cinderella-style carriages. Set just up above the square, Tuk-Tuk Spain is coming to the end of its first year and has been a major draw for thrill-seekers and anyone lacking the stamina to scale hilly Mijas. From the burro stables you can see what looks like a massive boulder to most newbies. The Ermita de la Virgen de la Pena is, in fact, an endearingly unpretentious little chapel. Forget the checked tiles of Notre Dame or the Sagrada Familia’s spiky, bejewelled interior. The hermitage was hollowed out by a single Carmelite monk in the 17th century. Outside, a stone gargoyle spouts water into a grand font. Inside, the candle light, bumpy floor, six ornate gold benches, fresh flowers and a small exhibition are a real treat. 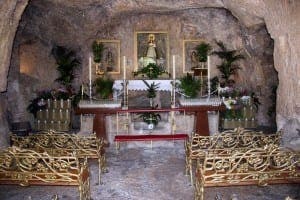 Leaving the chapel, I see a pair of pale-skinned Japanese tourists sitting on a bench hollowed out of the rock using an umbrella to shade themselves from the late-March sunshine. Al fresco dining has been up and running in the hilltop town for several weeks, with not a table free near the Mirador del Compas, where you can dine to the musical swoosh of water – provided by the charming fountain, not Handel! “It may be busy today but Mijas is popular all year round, like diamonds,” confides Francisco, a nut seller who has lived in the town all his life. Rightly, he is capitalising on the buzz to flog his delicious candied almonds which give me renewed strength to hit the ground running. Mijas is designed for its multicultural tourist scene – with around 20,000 foreign residents and many, many more visitors. Signs appear in English and there is even an impressive machine vending t-shirts, maps and guides after trading hours. Welcome to the future, I chuckle. And yet the human reception is second to none. Carmen in the Tourist Office, who hails from Valencia, gives me the inside track on just about everything in immaculate English. In fact she offers maps and info in an incredible 16 languages! There is a fabulous Picasso, Dali and Miro exhibition running at the Centro de Arte until June 1 and well worth a visit for a measly €3. Plus free flamenco in the main square every Wednesday and Saturday at noon, weather permitting, rivalling any you’ll see at Sevilla’s tobacco factory or in Granada’s celebrated caves. Let’s not forget the countryside. There are beautiful hiking trails waiting to be explored. Sign up for ‘senderismo’ at the tourist office for any one (or all) of three weekly routes. Multilingual guides lead groups of up to 30 around paths of varying difficulty – an energetic and sociable affair. 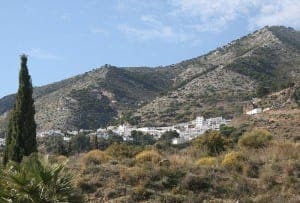 “The biggest reason Mijas draws people in is because we are close to the biggest Costa towns yet a typical Andalucian pueblo blanco which people love, complete with donkeys and mountains,” explains Carmen. Get a free town walking map that emcompasses the key sites in a leisurely two hour stroll – providing you don’t make too many watering hole stops. Several museums and plazas are worth a look-in, in particular, the oval-shaped bullring built in 1900 and the main town museum adorned with speciality esparto products and some fabulous photos. On top of this is the intriguing miniatures museum, squeezed into a conspicuous yellow caravan, as well as the handsome town hall. Rest your weary legs in the tranquil Plaza de los Siete Canos and poke a nose inside the eighteenth-century Ermita de Nuestra Senora de los Remedios before wending back to central Plaza de la Libertad via Calle Larga del Palmar and Calle San Sebastian. The latter is ‘officially’ Mijas’ prettiest street and houses much of Canadian businessman Thomas Weller’s restaurant empire, including Aroma Café & Secret Garden, Meguinez, and the Mariposa shop (Bana Bana and Latitud 36 are elsewhere). Softly-spoken Weller can often be seen tearing between his numerous establishments. Bana Bana won Mijas’ top tapas award last year for the second year running, thanks to head chef Txelo’s daffy duck confit and truffle milhojas with lemon ice cream! There are tapas haunts and restaurants to suit every taste and budget in Mijas, while the open air auditorium becomes a great concert venue, often hosting tribute acts in the summer. Every local I meet seems to have lived here their whole life: sun-shrivelled Antonio, who cannot remember his own age, clutches my arm enthusiastically to lead me to the art museum while telling me about how town has changed. We pass boutiques, delis and a baking dynasty that has been going since 1904, with grandson Francisco now in charge. It’s easy to fall in love with this enchanting pueblo. At a zapateria, fresh-faced shoe-seller Celia recalls how her Liverpool mother met an Andalucian in Ibiza in the 60s, married him, moved to Mijas and never left. Shoe fetishist Nikki who has a pair of alpargatas (espadrilles) in more than 30 colours – the sign of a true española – was similarly smitten. 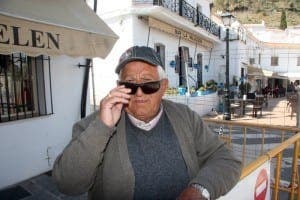 A cool glass of tinto de verano later and I feel so welcomed by Mijas’ residents that I’m dreading getting back in the driving seat to head for the coast to the municipality’s ‘other half’ – Mijas Costa. 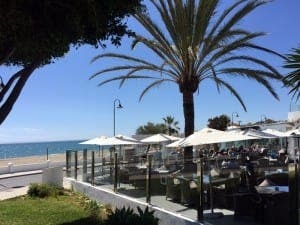 But the welcome in La Cala is equally good – restaurateurs, professionals and locals are all desperate to tell me about their slice of paradise by the beach. 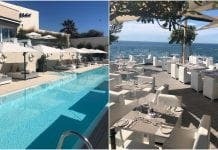 Be it a Sauvignon Blanc in Olivia’s – run by TOWIE star Elliott Wright – or a pint of Guinness at Biddy Mulligan’s – run by Davey from Ireland – there is something for everyone in La Cala to sit back and unwind. But as Francisco the nut seller put it, multi-faceted Mijas is like diamonds – in demand year-round, and everyone wants a piece of it. Bling it on!